Join us for a special event on Friday, April 12th, 2019 at 12:30pm in Music Building 800 in Room 818. The Honors Recital features our dedicated music students who have received awards for their Outstanding Jury Performances during the Fall and Winter quarter examinations during 2018-19. The line-up of performers includes vocalists, pianists and a variety of instrumental musicians. Please attend this special event and support our talented students as we celebrate their musical achievements. Everyone is invited to this free event. Small fee for parking during the daytime. 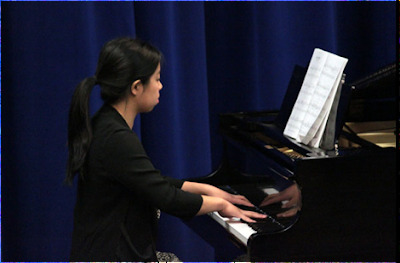 Students enrolled in private lessons (i.e., vocal, instrumental, piano), work very hard every quarter to prepare for their formal examination before a jury of music faculty. Students perform a selected piece for the jury examiners, who will evaluate and provide students with a critique of their performance. Students hope to receive an Outstanding Performance award or an Honorary Performance award. Students who receive the Outstanding Performance Awards are asked to perform their winning piece at an Honors Recital, along with the other award-winning students who have reached this high achievement.